The years between the defeat of Napoleon in 1815 and the revolutions of 1848 were a time of relative peace, prosperity, and innovation in German-speaking Europe. The period acquired its name from a minor fictional character of the day named Gottlieb Biedermeier, who embodied sober, solid—even philistine—middle-class values. The period’s furniture is characterized by a modest, chaste style derived from earlier classical forms but simpler and more domestic in scale. 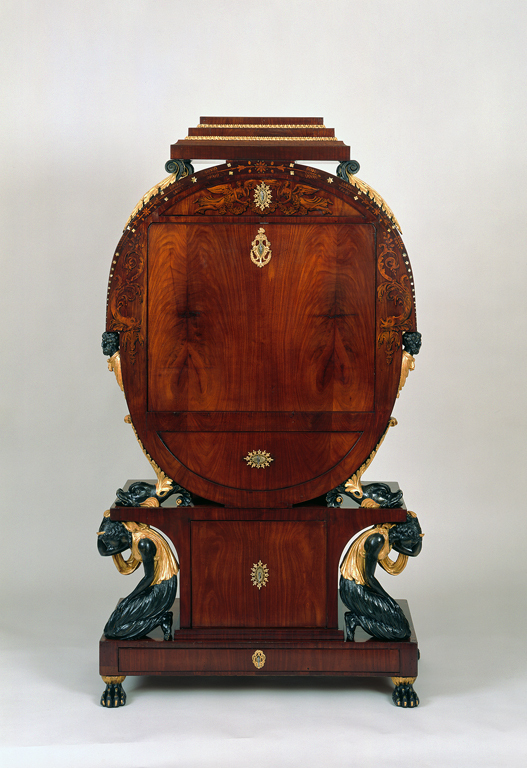 This example’s inventive and popular lyre-shaped form, supported by gilt caryatids and dolphins, identifies it as one of the eccentric, complex cabinets made in Vienna during the early Biedermeier period. The upper half of the front falls forward to serve as a writing surface, revealing interior compartments, drawers, and shelves. Stoodley, Sheila Gibson. Birth of the Modern, Art & Antiques (June 2016): 39–40. Ottomeyer, Hans, Klaus Albrecht Schröder, and Laurie Winters. Biedermeier. Paris: Musée du Louvre, 2007, p. 66, cat. 5, color illus. p. 64–5. Winters, Laurie. An Introduction to the Biedermeier Period, The Magazine Antiques 165, 1 (January 2004): 180–81, pl. 4. Andera, Margaret, Nonie Gadsden, Britt Salvesen, and Laurie Winters. Collection Guide: Milwaukee Art Museum. Milwaukee, Wisconsin: Milwaukee Art Museum, 2004, pp. 19, 68, cat. 23, color illus. p. 19. Fabiankowitsch, Gabriele, Christian Witt-Dörring, and Peter Noever. Genormte Fantasie: Zeichenunterricht für Tischler, Wien, 1800-1840. Vienna: Böhlau, 1996, p. 56, fig. 6. Biedermeier: The Invention of Simplicity, Milwaukee Art Museum, September 16, 2006-January 1, 2007; Albertina, Vienna, Austria, February 2–May 13, 2007; Deutsches Historisches Museum, Berlin, Germany, June 8–July 2, 2007; Musee du Louvre, Paris, France, October 15, 2007–January 15, 2008.